If you watched the TV series Mad Men then you are familiar with account-based marketing (ABM) -- whether you know it or not. Don Draper and his partners had some key accounts throughout the series that they would work tirelessly to pursue. Remember Lucky Strike? Jaguar? Chevy? Wooing executives, expensive dinners, and long nights spent by the agency’s creative team were all part of their efforts to land a big-fish account, either for the revenue they would bring in or for the new industry or segment they could add to their portfolio. While the 1960s Mad Men-style of client schmoozing and boozing may look a little different today, the idea of specifically targeting a few big accounts is still a viable marketing strategy. So what exactly is ABM like in today’s digital, big-data, technology-fueled business world? Let’s start by expanding on our definition of account-based marketing. The opposite of traditional demand generation, ABM focuses both marketing and sales resources on a specific set of accounts to deliver strategic, targeted campaigns that are highly personalized. 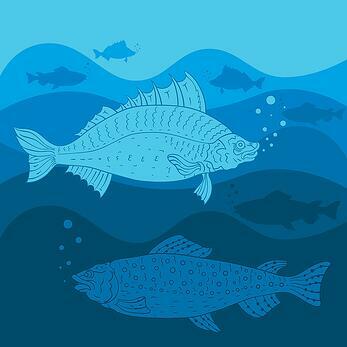 Think of it like this: traditional marketing is like fishing with a net; ABM is like fishing with a spear. Accounts that are chosen to target are high yield and deemed to be a good fit for your business’ products or services. You want to acquire these accounts because they stand to generate more revenue, will help you penetrate a new territory, or have some other strategic importance (like taking business away from competitors). Companies should use ABM if they have a few, highly-desired accounts to go after or if they want to target a group of accounts that share similar characteristics (i.e, same vertical, all use the same technology, etc.). Alignment between marketing and sales. This is often a problem in many organizations that suffer from a lack of communication and flow of information back and forth between the two departments. With ABM, both are moving toward a single goal and work closely to identify target accounts and pursue them. Efficiency of resources. Since it is so targeted, efforts on broad-reaching campaigns and programs are reduced, eliminating a lot of waste that often occurs. ROI is clear and easy to measure. Setting goals and defining success is simplified with ABM. Companies using ABM also reported that they achieved a significantly higher ROI than with other marketing initiatives. Personalization = optimization. Today’s consumer expects highly personalized, relevant content and delivering what they want will result in a better experience. When the messaging and content resonates with the audience, engagement and movement along the buyer’s journey is far more likely. Account-based marketing requires planning, strategy, and a strong understanding of whom you are targeting. The next blogs in this series will focus on how to execute ABM, from determining whom to target, to planning your campaigns and content, to how to establish analytics and measure success. Stay tuned to learn more about how you can apply this marketing tool to your company’s efforts. Curious about how we can help improve and optimize your marketing strategy? Connect with us today.